We headed to our group run last Tuesday just a few hours after getting off a plane from Tampa. It was a hilly route, and after two weeks of birthday fun, vacation workouts (swimming in the Gulf for 15 minutes is the same as 3,000 yards in the pool, right?) and an Indian wedding (just *try* to tell the aunties from India you’re full), I was dragging. Steve had looped back around to ferry me up the last major hill of the route, looking a bit bedraggled himself. 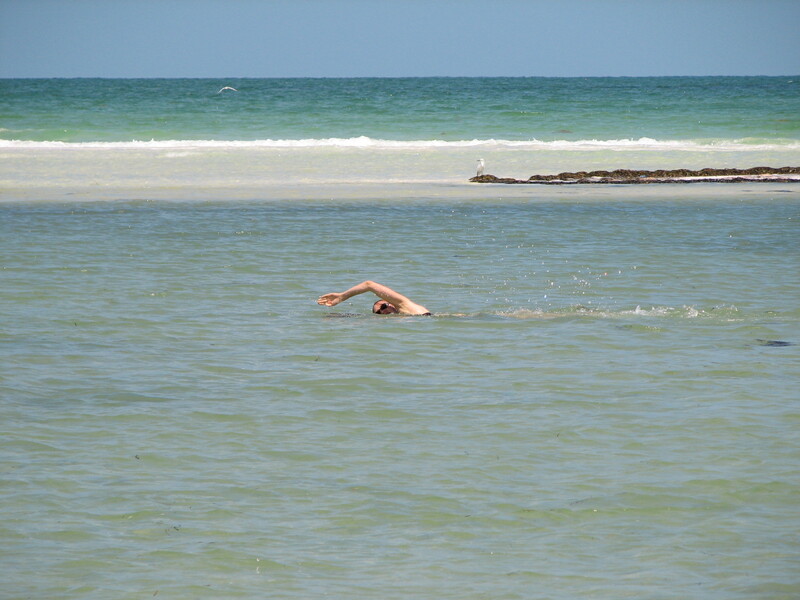 My "workout" one day in Florida consisted of a few laps along the shore of an island in the Gulf. “Turns out cookies and brownies and ice cream aren’t the best training foods,” he grunted. Had I been able to breathe, I would have grunted in agreement. It’s not like either of us thought stuffing our faces with rich, sugary foods and squeezing in halfhearted 30-minute runs was a winning strategy for speed and endurance. It’s just that it’s stunning to see how quickly you can go from feeling awesome and in shape to feeling like you’ve gained 20 pounds in samosas alone (which would have been worth every ounce if this were true, by the way). But I didn’t spend long feeling bad about this. Training, like anything else in life, has its ups and downs. Taking it easy for a few weeks every once in a while—hopefully, on account of weddings and vacations rather than traumatic injuries—gives us the motivation to crank up the intensity all those other weeks. That’s why I’ve decided to not only accept, but embrace, my recent slackerdom, even as I get back into the swing of my regular routine (which includes hill and speed workouts, and not celebrating 3 p.m. with my daily piece of leftover birthday cake). My rough but fun 10K on Sunday. My finish time at the ZOOMA Annapolis 10K on Sunday was perhaps my worst 10K time ever —likely a combination of the heat, the hills and my decision to take a second piece of the chocolate wedding cake with cookies ‘n’ cream icing (trust me: you would have, too). But it was one of the best times I’ve ever had at a race, once the whole “running” part was through, thanks to free wine and a crew of good running buddies. The longer I run, the more I appreciate having a good time rather than running one. Another fun race in its wake in the Clifton Caboose Twilight 5K this Saturday. Race Chairman Gary Anderson, who regular readers know suffered a similar wrist break to mine last February, saved me a spot in this race back when running was a faraway post-surgery dream. He described the course this way in the Clifton Connection newspaper: “It’s a little hilly and fairly challenging. It’s also very scenic and, I think, one of the more unique races in the area. It’s a twilight run and, being out in this rural area, it’s quiet and peaceful.” A little hilly? Challenging? Ah, well—at least it involves live music and free beer at a post-race party in an old red barn. A new training cycle. I’m officially signed up for the The Rock ‘n’ Roll Virginia Beach Half Marathon on Sept. 5! I’ll start training using my beloved FIRST plan to train for it starting the first week of July. A new plan for posting on this blog. I never really found my way back to daily posts after being unable to type post-wrist surgery. My new plan is to post here every Monday, Wednesday and Friday, with Motivation Mondays and runner-friendly recipes making weekly appearances. Thanks for sticking with me through the past few months of sporadic updates (such as posting a Motivation Monday on a Tuesday). I’m happy to be back on the wagon now, in more ways than one. Mmm, totally agree on the samosas. And I too may have had no less than 4 pieces of wedding cake this weekend prior to my 10k this coming Sat. Oh well, they can’t ALL be PRs or they wouldn’t be special, right? Hope to convince you to join us for hilly trail runs on the occasional Tuesday night . . . Pretty sweet open water workout. Ha, I like ultrarunnergirl’s attitude!